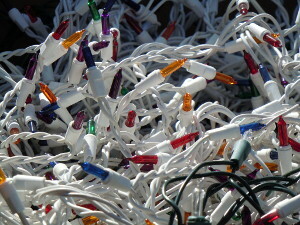 Scrap Christmas lights are derived from Christmas trees and decorations, and may or may not include bulbs. They are usually found in larger quantities in the holiday seasons where many are discarded. It is not recommended to clean these wires by removing the bulbs and stripping the wires, as it is time consuming and the copper recovery rates are low. Most scrap yards and dealers will buy these wires as-is. Christmas Lights are considered to be valuable scrap materials due to their copper content and can be sold to scrap yards and dealers at fair prices, usually by the pound.